The exact origins of barbecue sauce are unclear but is believed to have come from South Carolina some time in the seventeenth century. It is generally a tomato and spice-based sauce; however, there are huge differences in varieties all over the US. 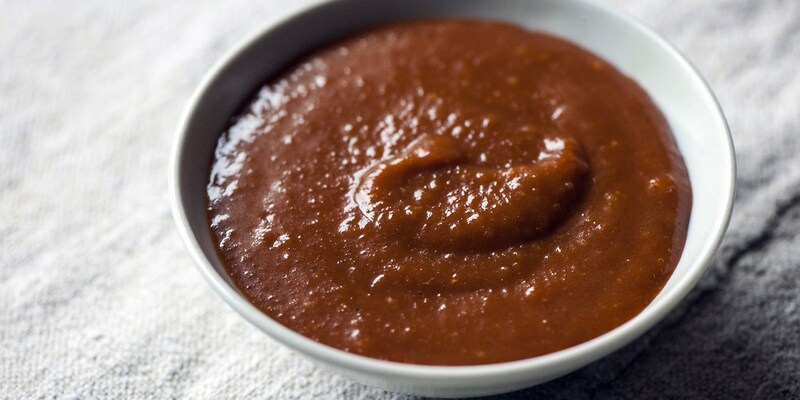 Originally used to baste meat during cooking, barbecue sauce is also now more commonly served as a condiment similar to ketchup and brown sauce. For a less sweet version, replace the ketchup with some onions and chopped tomatoes that have been sweated until soft. Try adding chilli flakes or Tabasco if you're after a bit of heat, or for a smoky version, add a teaspoon of smoked paprika, or infuse with delicious smoky chilli varieties such as chipotle or morita. Multiple flavours can be added, so feel free to experiment – Marcus Wareing adds garlic and lemon juice to his version whereas Adam Gray uses apple as the base for his recipe. Use barbecue sauce as a marinade for meat – beef, pork and chicken all work well. Josh Eggleton barbecued sticky ribs in barbecue sauce, while Marcus Wareing uses barbecue sauce as a glaze for pork chops. Alternatively, use it like ketchup for burgers, steak or chicken wings.